For some reason, this month’s food magazines had me drooling. I may have been starving when I was flipping through, but I bookmarked almost every recipe. 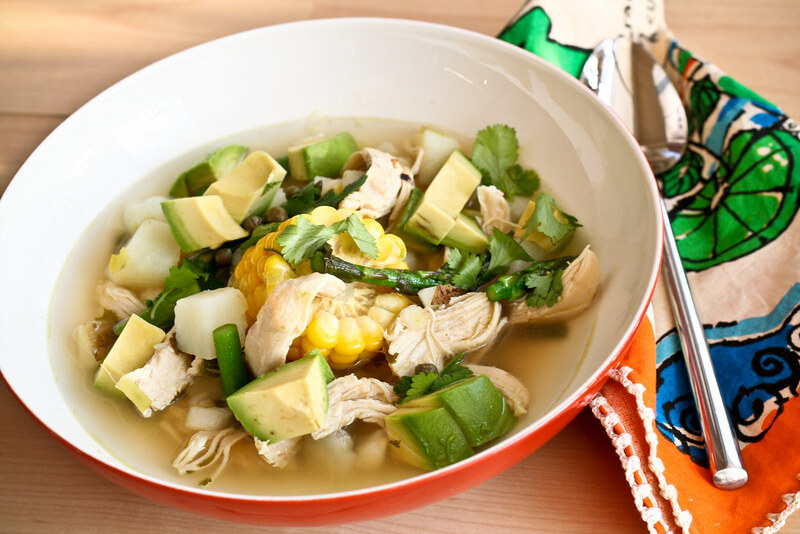 One in particular caught my eye – a lighter, healthier version of Ajiaco, the traditional Colombian Chicken Soup. I know what you’re thinking. Chicken soup? Booooring! But this isn’t your mama’s chicken soup (though I would never, ever turn that down). This one is flavored with cilantro and cumin, is chock full of chicken, potatoes and corn, and in this case, asparagus and hominy. Everything is topped off with diced avocado, more cilantro and capers. It’s simultaneously light and hearty, and it’s really, really good. I just wish I’d had a bowl of this when I was sick last week. Good thing I froze a huge batch for next time I’m feeling under the weather, though let’s face it – it’ll be gone by next week. Adapted from Food & Wine, May 2009. Set a large pot over medium-high heat and heat the oil. Once it’s hot, brown the chicken on all sides, then add the garlic, green onions, corn, cumin, cilantro, cayenne pepper and chicken stock. Let it come to a rapid simmer, then reduce the heat to medium, cover and let cook for 15 minutes. Remove the chicken to a plate and shred it by using two forks to pull the pieces apart. Return the chicken to the pot and add the potatoes. Simmer until tender, about 8 – 10 minutes. Add the asparagus, hominy and lime juice and simmer for 5 minutes. Add the pepper and salt to taste. Ladle from the bottom of the pot into big bowls. Garnish with cilantro leaves, avocado and a few capers. Looks delish! Especially with the avocado on top. I’ve never had a soup with avocado on top – this may have to be my first go at it! My mom made traditional Ajiaco for me for Christmas and it was so good but pretty heavy. I am excited to try this lighter version! The photos are gorgeous! And yum! I love this kind of soup – so fresh and flavorful. Thanks! That looks so pure and healthy. Hey Mel, since you have a huge batch of this soup and I am Colombian. I can be the perfect judge to let you know how authentic the soup came out. Don’t need to respond, I’m on my way. THANKS!!! How did I miss this in F&W?! I’ll definitely have to give this a try! Miche – Too bad it’s all gone. When are you going to invite me over for some real Ajiaco? Huh? My husband wants to send his apologies. I was feeling not too good, and wanted to make this. He was wrinkling up his nose at it and said it looked “weird” (which is odd, as he isn’t picky at all). I told him it was dinner, and he was going to have to eat it. He took 2 or 3 bites, and looked very sheepish, and said it was the best soup he’s ever eaten. Oh thanks for this recipe! My two boys are adopted from Bogota and … yes we did have this there!!! YUM.